Released in 1991, Beauty and the Beast is the movie that defined my child hood. To this day my father can still quote every word, and jokes to all my family about a time when I would beg ‘Watch it with me just one more time Daddy!’ Maybe it was the fact that Belle grows up a social outcast with a single father and no real explanation as to where her mother went. At the age of two I certainly wasn’t conscious of these parallels but looking back I can’t help but wonder what exactly it was about Beauty and the Beast that made me obsess over it more than any other story in my life. There’s a castle where a boy refuses a beggar woman to stay for the night and she transforms him into a hideous Beast who must make someone fall in love with him before an enchanted rose wilts. 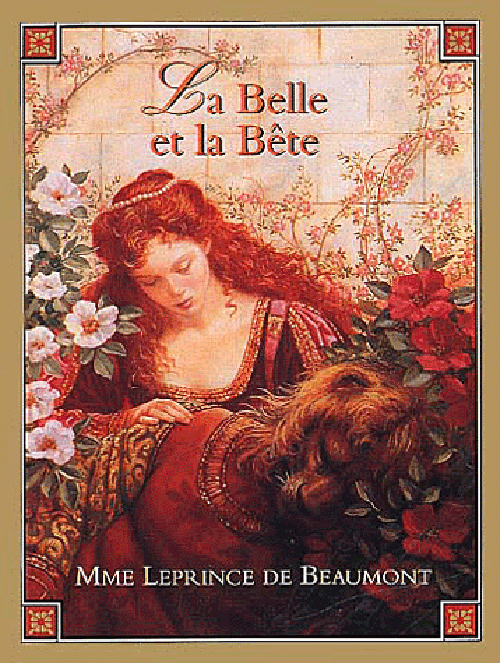 Belle, lives with her inventor father Maurice in a small French town where everyone thinks he’s nuts and she’s weird. ‘Fortunately’ the arrogant hottie of the town, Gaston, thinks Belle is the most beautiful girl in town, so it doesn’t matter that she’s weird, he’ll marry her because prettiest = best. Belle’s father goes off to an inventors fair and gets lost. Gaston proposes to Belle, and abhorred by his proposal she runs out into a field to sing with dandelions. 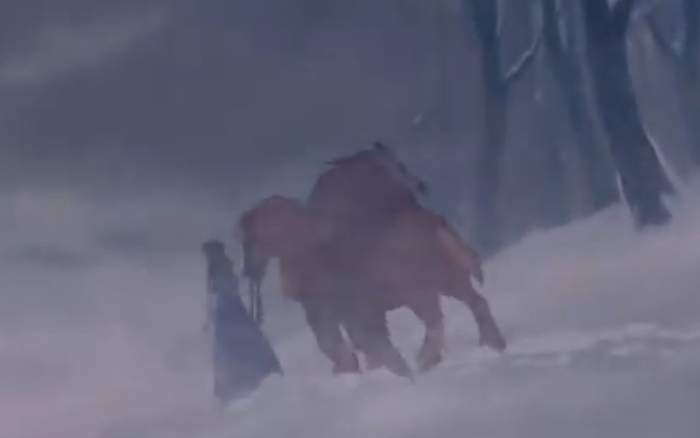 Suddenly her horse Phillipe shows up, demonstrating that her Father must be lost and she runs off in search of him. Finding a giant creepy castle and her father’s hat, Belle wanders into a strange building. Finding he father locked away she selflessly offers to trade her life for his. A prisoner in his castle, the Beast is at least nice enough to give her a room instead of locking her in the tower. 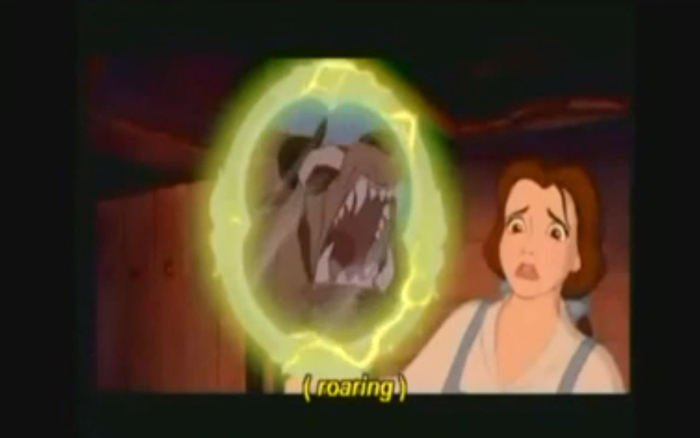 Belle goes wandering into the one place in the entire castle she knows she’s not supposed to go and Beast yells at her. She gets emotional and decides this is the deal breaker and that she can’t stay here anymore. She runs out into the woods, gets cornered by wolves and then needs the Beast to save her life. He’s wounded, they go back to the castle and she fixes him up. He decides to do something ‘nice’ for her and so he shows her the library. Time passes and through the efforts of the enchanted objects (formerly servants in the castle) the Beast gets a little Tamer, Belle gets a little bolder then suddenly BAM they are in fancy clothes and in love. However its not all happy endings yet. Suddenly Belle gets all forlorn missing Daddy and Beast gives her an enchanted mirror which will allow her to see him. One look in the mirror and Daddy is lost in the woods again, (This time because the villagers thought him crazy and refused to help him save Belle from a ‘Beast’) Beast has real emotions and sets her free and Belle runs after her father. Taking Maurice home to take care of him, Gaston shows up at their cottage door and demands that if Belle doesn’t marry him, her father will be locked away in an insane asylum. 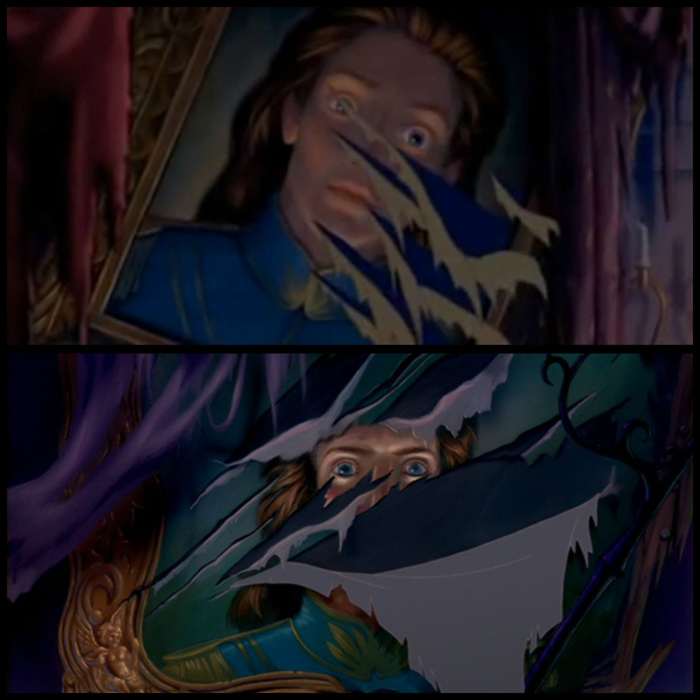 To prove her father’s sanity she shows the villagers the Beast in the magic mirror (and they all freak out over the beast, not the shiny magic glass that is glowing and acting like a television, which wont be invented for another hundred years or so) and then they lock Belle in a cellar and head to the castle to kill the Beast. Belle manages to get free, and dashes off to the castle. The villagers get their butts kicked by a bunch of enchanted objects, (although there is rather questionable moment with a villager and the feather duster) and Gaston attacks the Beast. Beast, without Belle has no reason to live, or so he assumes, and doesn’t fight back. Suddenly he see’s Belle pull up and decides to defend himself. During all this the Beast ‘wins’ and lets Gaston go, but ever the jerk, Gaston attacks again and ends up falling to his death. The last petal of the enchanted rose falls and everyone thinks Beast is dead, Belle cries over him and then suddenly there are fireworks and the most disappointing transformation of all time. The Beast is now a prince, the enchanted objects get to be human again, and everyone gets a happy ending. As a child I accepted this plot at face value. It was teaching me not to judge a book by it’s cover and even deeper, to treat others the way you wanted to be treated. It wasn’t until I got older that I started asking myself questions about the story line. Now I’m not just referencing the ‘Stockholm syndrome’ appeal for this story, I’m sure we’ve all heard this negative connotation about the film. For those unaware, Stockholm syndrome, also known as capture-bonding is a psychological occurrence where hostages express empathy, sympathy or other positive feelings towards their captors. This can be to the point of defending them or even ‘loving’ them. Now with this basic definition it is easy to see how this fairy tale can be analyzed through this lens, but as I stated, this analysis has been done to death. Plus I have other questions for Disney. The biggest one is – where are the parents?! And why is this enchantress taking all her rage against humanity out on an eleven year old boy? Did I lose you? Let me explain, in the opening prologue the narrator states “The rose which she had offered was truly an enchanted rose which would bloom until his 21st year”. So with this deadline established, when Lumiere sings in ‘Be Out Guest’ much later and says, “10 years we’ve been rusting, needing so much more than dusting.”, it would lead us to believe that the Beast was 11 years old when he was transformed. Now don’t get me wrong, I’m not a huge fan of kids in general and I firmly believe in disciplining them, but doesn’t this seem a bit extreme? Furthermore to take it out on the whole castle…makes me wonder whether or not this Enchantress had some anger issues. Now sure one could argue, if there are no parents, then it has been up to those working in the castle to raise this prince and thus it is their fault that he is “spoiled selfish and unkind” but it still seems a bit outrageous to me. 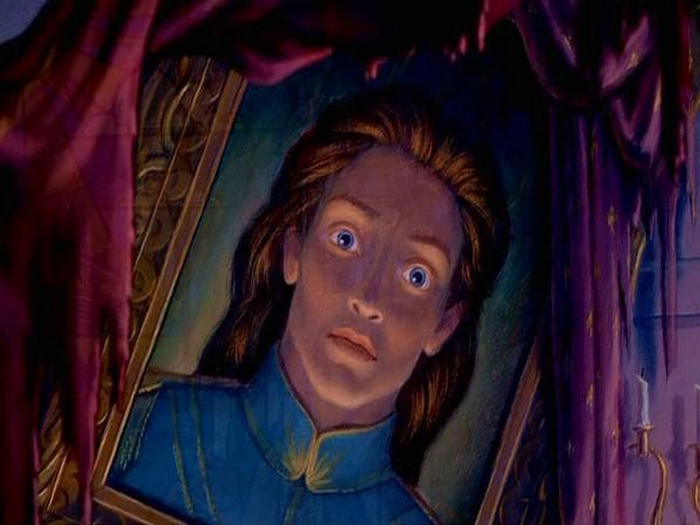 On the fact that this boy was 11 when he was transformed… who the heck is in that portrait?! While I appreciate the fact that they wanted symmetry between the man who appears at the end of the film and the person in the portrait… it again seems rather ludicrous given the time frame. Furthermore Chip – a child… who is his father? How was he born? How did Mrs. Potts have another child at her age? Was he born a cup? I have a lot of questions regarding chip. Also, while I agreed that a decade is a long time, it doesn’t really seem like a long enough time for a village to completely forget about a castle and prince… particularly one that is enchanted. Did this royal family have no actual leadership over this town? And if not, you are seriously telling me that nobody tried to rob what might have appeared to be an abandoned castle to either come back with horror stories or not come back at all and be the birth of horror stories? The fact that it is just the ‘mystery place’ in the woods that people can both find with great certainty (all the villagers and Gaston at the end despite not knowing of its existence) or can never seem to find it (Belle’s father as he attempts to go back to ‘save’ Belle… you were already here before, did you honestly forget the way?) Part of me feels that the castle must have been sitting on the rift to another reality, cause none of this makes sense in my brain. Another major question I’ve always had, although less important to the plot… when Belle is out in the woods and gets attacked by the wolves, Beast comes to her rescue. He in turn is attacked and ends up passing out… how exactly does Belle manage to get the Beast upon Phillipe? Not to be rude here, Belle may be brilliant, but filled with Wonder Woman’s Amazonian super strength she is not! I remember this actually bothering me a lot as a child, long before I’d given thought to any of the other ‘questions’ bred by this movie. That and why Gaston ate eggs, shells and all, and what would have happened if Belle touched the rose?! Okay, I guess I’ve always had a lot of questions. As with any movie there is also a plethora of continuity errors throughout this film. For example during the opening number Little Town, Belle’s book changes placement in the basket as well as colour, there is even a moment where the basket disappears all together. My favourite part of this number is when Belle is reading by the fountain and one of the sheep eats part of the page. (If you look closely at the picture on the page you’ll notice that it is in fact Belle and the Prince). However moments after the song is finished Gaston picks up her book and wonders how she can read it due to the fact that there are no pictures in it, despite the fact they just showed us a close up of one. Also concerning Gaston, during his number the bear rug travels on it’s own from shot to shot, and when Belle rejects his proposal you seem him fall out of the door way, but then the door slams shut from the inside. With Gaston comes his blonde minions, I’ve always wanted to find two other ladies and do these three as a cosplay, but what hair style would I choose?! You’ll notice throughout the movie sometimes they all have the same hairstyle, while at other times the parts in their hair move or they have Ariel-like bangs. Other continuity errors include the wishing well outside Belle’s house that disappears later when Chip comes to free her, Belle’s magical apron that appears and disappears during the mob scene, Belle’s ability to magically put her coat on while running down the stairs when she’d previously left it in her room and the number of claw marks on the Prince’s portrait. I’m sure there are many more throughout the movie, but these were the ones that always cause me to ponder, or be proud of me observation skills. To that end Disney is also infamous for its many crossovers and Easter eggs, and if you weren’t already aware of this, you may spend the next two weeks re-watching all your favourites. Beauty and the Beast is brimming with these crossovers, my favourite of which is that Gaston’s horse is the same horse from The Adventures of Ichabod and Mr. Toad (The Legend of Sleepy Hollow). That’s right, Gaston and the Headless Horseman share the same steed! This film also reused footage from both Sleeping Beauty and the Black Cauldron. 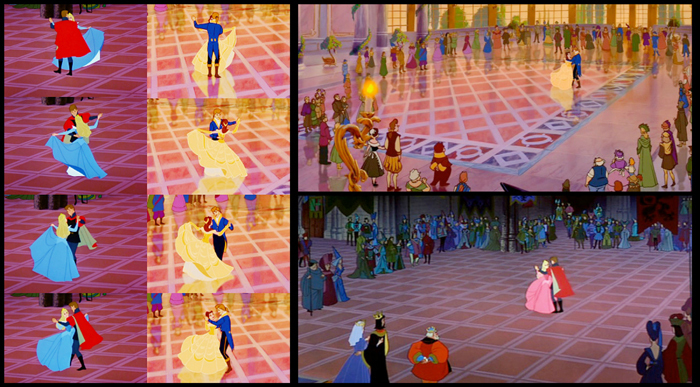 In the final dance sequence between Belle and the Prince animators reused crowd footage for the people surrounding the couple from Sleeping Beauty. Similarly the smoke screen that Beast transforms in, is footage from the Black Cauldron. 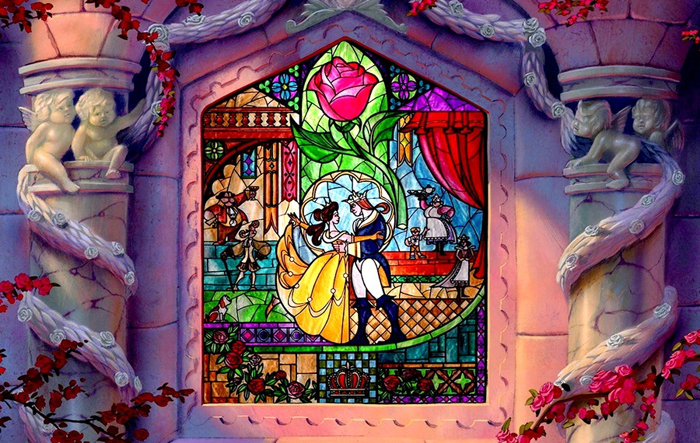 Not only does Disney’s Beauty and the Beast feature other Disney films, but the characters have been known to travel. 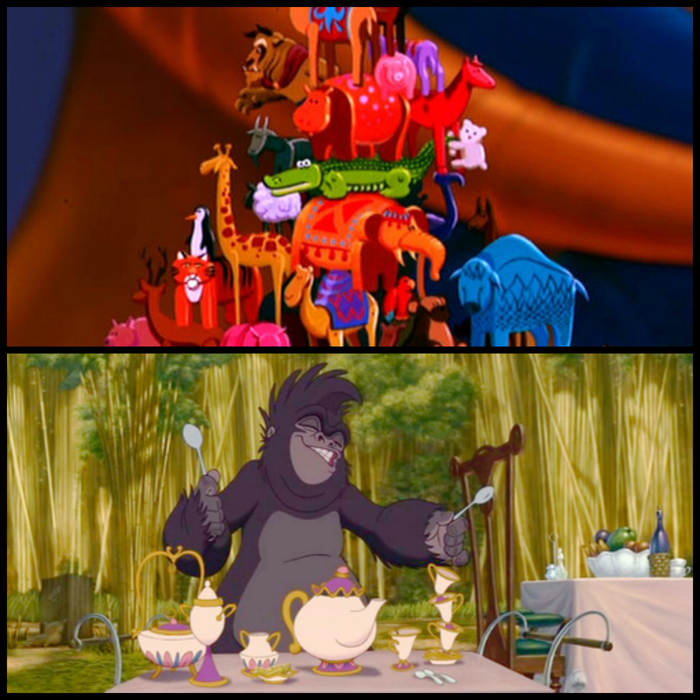 The most commonly spotted is Beast in Disney’s Aladdin. When the Sultan is building up all his toys if you his pause you can see Beast among the figurines. Belle is also a wanderer being featured in the crowd scene of “Out There”, during Disney’s Hunchback of Notre Dame, and as a figurine on Morgan’s mantle in Disney’s Enchanted. 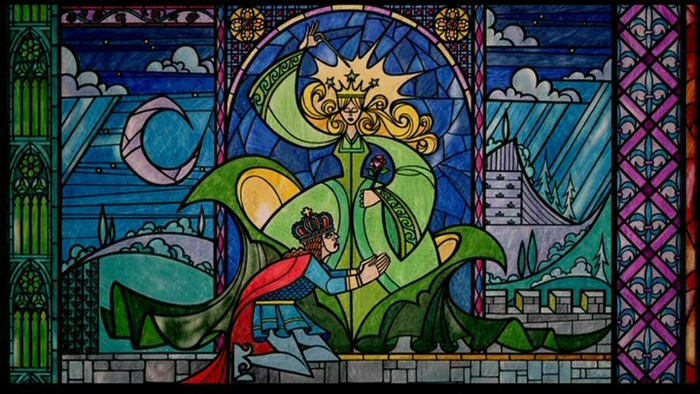 During Disney’s Tangled when Rapunzel and Flynn are surrounded by dozens of books, one of them is Beauty and the Beast. Perhaps more popular than either of the title characters, however, are Mrs. Potts and her son Chip. These two are featured in Disney’s Tarzan, Meet the Robinsons and An Extremely Goofy Movie. During the Lion King 1 ½ there is a scene where many of the characters are seen in shadow including Belle, Beast, Mrs. Potts and Chip! Personally, my favourite references in Beauty and the Beast were always the Shakespearean ones. Now if you’ve only watched the original release, unfortunately you’re missing the best one. In the re-release of the film they added the song ‘Human Again’ back in after its immense success during the Broadway show. In addition to the song, there is a short scene at the end where Belle says “There never was a story of more woe than this of Juliet and her Romeo” as she finished reading Romeo and Juliet aloud to the Beast. He smiles and asks her to read it to him again. Here we learn that the Beast has never learned how to read, and Belle begins to teach him. It is only a thirty second scene, and it may seem trivial, but personally, those thirty seconds made the balcony scene at the end ever so much more beautiful. 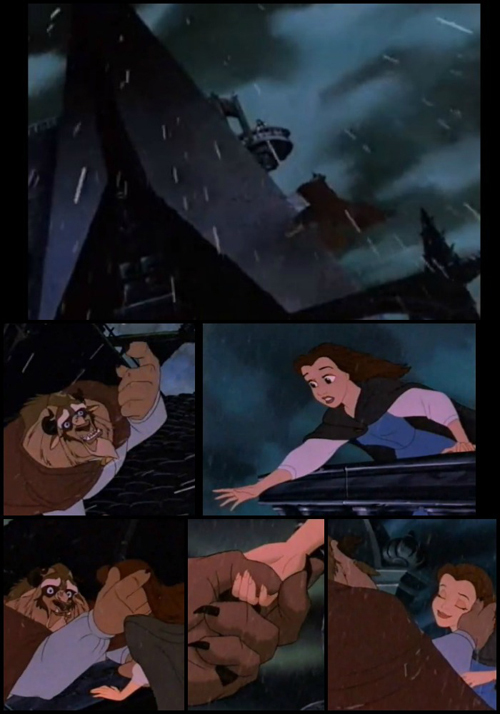 Yes, that’s right folks, the balcony scene at the end when Beast climbs up to meet Belle is a Shakespearean parallel. The second, subtler parallel is the reference to Macbeth. During the mob song when Gaston is leading the villagers to the castle one of the lines of the song is “Screw your courage to the sticking place” which is spoken by Lady Macbeth in Act I Scene VII, when she is trying to drum up the courage in her husband to kill the king. There are a lot of other fun things to catch in this movie too. 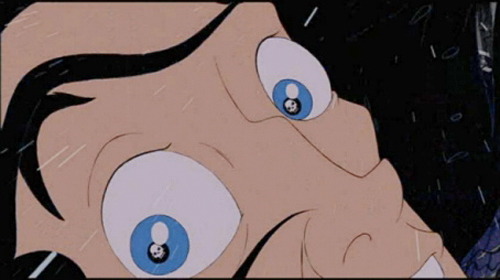 For example, did you know that when Gaston falls of the cliff, in one of the frames just before his tragic demise you can see skulls reflected in his eyes? (However this will not be seen in the VHS or laserdisc release, only the theatrical and DVD release). If you are native to California, when Maurice is lost in the woods, you may recognize some of the names on the signs including Anaheim and Valencia. Additionally some of the more adult humour such as Cogsworth’s line “Flowers, chocolates, promises you don’t intend to keep… ” was in fact ad-libbed by David Ogden Stiers and not a part of the original script. Additional adult humor can be found during Little Town when Belle walks up on a cart while reading her book and a creepy villager leans down to look under her skirt. Fortunately the karmatic balance of Disney leads to him getting clocked by the same ramp that Belle is walking up and with stars around his head he falls to the ground. For those who have any knowledge of French, the names are also fun. The easiest of which to translate is Belle meaning Beauty, but also Lumiere meaning light or LeFou, Gaston’s sidekick, whose name translates into the fool, or the crazy one. Other puns include Mrs. Potts for a teapot, Chip for the chipped tea cup and Monsieur D’Arque a play on dark for the asylum keeper who isn’t exactly cheery. The use of colour in this film is interesting as well. You may not have noticed initially, but did you realize that Belle is the only character to wear blue? Well, that is until the Beast dons his blue suit. This is to help drive the point home about how different they are and feel. The use of statues is fun too. All the creepy creatures that surround the castle while it is cursed, most of them are in fact earlier art concepts for ‘the Beast’. The one ‘fun’ thing I’ve never been able to get behind however is the use of ‘Adam’ as a name for the prince. Why you ask, because it is not his name at all. According to the director’s commentary, the Beast never had a name he was simply known as Beast, or the Prince. So where did Adam come from? We can thank the 1998 video game The D Show that was developed by Cyberflix. It was in this game that it was stated that the Beast’s name was Adam and since Disney licensed the product, despite having no part in its development, the mistake went viral. To this day there is TONS of merchandise with the name Prince Adam slapped on it, none of which I find desirable. It’s Beast or nothing for this gal. One criticism I like to challenge everyone who comes in contact with the story to consider – is that this is very much the Disney version. For years the film has been dragged over the coals as people believe that the movie is implying women should stay with their abusive boyfriends/husbands. However in many other versions, including the original, the Beast was not this nasty piece of work that has to be changed by Belle. This is the Disney version. Perhaps my favourite incarnation of this story is by the author Donna Jo Napoli. She contrasts Islamic and French cultures/traditions with a Persian prince and a French merchants daughter. In this story the poor prince was actually trying to assist someone and ends up being cursed by a mischievous spirit. Why they chose in the Disney version to make him so petulant and temperamental is beyond me. I also think it is important to consider that while Belle may be one of the main characters in the film, the story is Beasts. It is about his growth and maturation, it is his journey that we follow. 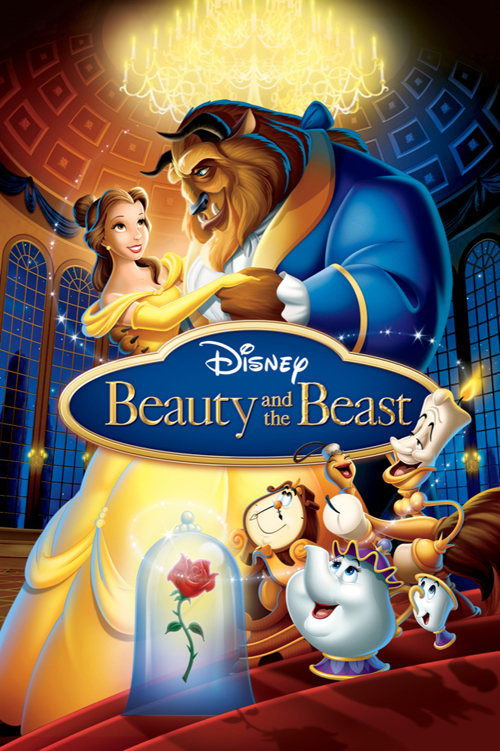 For a long time Disney’s Beauty and the Beast was the only animated film to be nominated for an Academy Award for Best Picture. (Until Disney-Pixar’s Up in 2009) While it was nominated for Best Picture it lost to Silence of the Lambs, however it was the first full length animated featured to win the Golden Globe for Best Picture (Musical or Comedy). 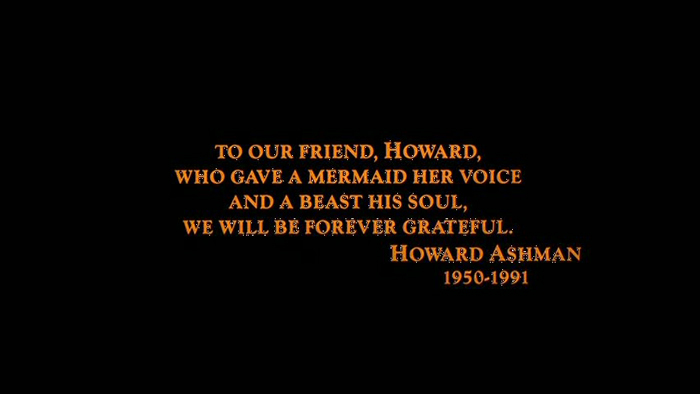 The one real tragedy of this film is that Howard Ashman, the lyricist, died before the movie was completed. During the making of the film many of the animators were sent to New York to work with Ashman and Menken, although many believed it was a big shot attitude, not because he was HIV positive. As they continued to work it became evident how sick Howard Ashman was. Some people even argue that Beauty and the Beast was a metaphor for people struggling with AIDs, with its parallels of not judging a book by its cover, and the mob song reminiscent of the mob mentality in retaliation those with AIDs. There is an in depth article reviewing this here. As a child, all I knew was that I wanted to be Belle and that this movie was the bees knees. Yet as I get older and began to reflect upon not only the movie itself, but the story, it’s history… it is all these layers that routinely keeps Beauty and the Beast on the top of my playlist. All these little elements have touched my soul throughout the course of my life. With thanks to my good friend Don’t Panic Cosplay, who is making Belle’s yellow dress for me, I will be debuting my first ever Belle cosplay Fan Expo Canada 2014 and I cannot wait to relive this story again in a whole new way.